​Í Heklusetrinu á Leirubakka er rekinn veitingastaður í hæsta gæðaflokki, þar sem meðal annars er lögð áhersla á mat sem unninn er úr hráefni úr héraðinu, svo sem bleikju og lambakjöti af Landmannaafrétti. Mjög fallegt útsýni er úr veitingasal Heklusetursins, þar sem oft má sjá folaldsmerar í forgrunni en í bakgrunni blasa við fjöllin Búrfell og Bjólfell auk sjálfrar fjalladrottningarinnar Heklu sem gnæfir yfir byggðinni í öllu sínu veldi. ​ Í húsinu er einnig góður fjölnota salur, þar sem hafa má fundi og ráðstefnur, þar er aðstaða til yogaiðkunar og margt fleira. 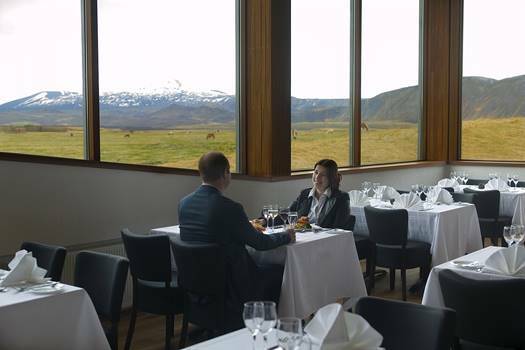 At the Hekla Center at Leirubakki is a fully service restaurant of the highest quality, where, among other things special attention is paid to food that is made from raw materials from the area, such as arctic char and lamb from Landmannaafréttur, a local district. There is a gorgeous view of the area from the dining area of the Hekla Center where guests can often see brood mares with their foals in the foreground, while the background is blazed with the mountains of Búrfell and Bjólfell alongside the queen of all mountains, Hekla herself, who towers over the settlement in all her majesty. ​In the house is also a hall which has had a variety of uses, including conferences and meetings, as well as, yoga practice, among other things. 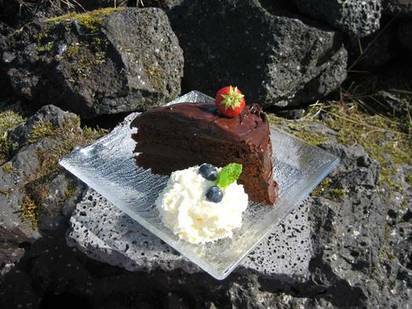 Traditional Icelandic oatmeal and rhubarb cake, "Bliss of marrige"